William Wyler had an astoundingly successful career on every level. He was strong box office, drawing in crowds with classics like Jezebel (1938), Mrs. Miniver (1942) and Ben-Hur (1959). His films received 127 Oscar nominations, of which he won 38 statues. His actors fared well too, with thirteen wins out of 35 nominations. Wyler directed his entire adult life, and thanks to strong support from his studios, he had a remarkable amount of control over the quality of his material. He took risks right to the end of his career, filming his first musical, Funny Girl (1968) at age 66 and tackling racism with a thoroughly modern brutality two years later with his last film, The Liberation of L.B. Jones (1970). He insisted on filming the projects he believed in and that rarely led him wrong. Give all of this, it doesn't seem right that Wyler isn't one of the bold name directors, like Ford, Huston and Hitchcock. This is partly due to the common critical claim that he was not a true auteur. A good craftsman, yes, but there was the idea floating around that he was supposedly not the author of his films. That belief has always made me hopping mad, because Wyler most certainly had ownership of his films and a fully developed cinematic vision. 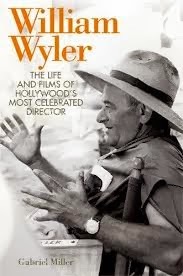 I'm grateful that Miller has made a solid argument supporting an auteurist theory in William Wyler: The Life and Films of Hollywood's Most Celebrated Director. Wyler's touch is subtle, but it is clear. Through this detailed review of several films throughout his career, the patterns begin to emerge and it's fascinating to see them develop. Not only did this legendary director have authorship of his films, he built an enduring, varied body of work stringing together his common themes and methods. Perhaps one of the reasons the nuances of Wyler's style have not drawn much attention is because he left so much to the audience. With frequent use of deep focus, he opened up the screen to viewer interpretation. You could see many dramas progressing in one shot, and while he would subtly frame the action to draw the eye where he pleased, there was always that extra layer of activity to color your perspective. The perfect example of this open-ended, but also focused staging is in the famous bar scene from The Best Years of Our Lives (1946). While World War II vet Fredric March is watching a fellow soldier pound out a lively song on the piano in the foreground, his attention is clearly on a phone booth in the corner of the room, where another friend is on the phone with March's daughter, breaking up with her at his behest. Wyler coaxes you to look in that corner, but he offers another bit of action to be considered as well, if not given full attention. Miller also explores the way Wyler uses power dynamics in his movies. I never realized how often he used actors standing on different levels on staircases to demonstrate which characters have the upper hand. It's such a simple effect, and I never noted it explicitly, but it had its intended effect. So yes, Wyler was an auteur, for these and other reasons that unfold throughout the book. He had a consistent style, common themes and a sort of social consciousness that could be seen in all of his work, from lighter comedies like The Good Fairy (1935) to the darkest of dramas, such as The Collector (1965), which he made late in his career. Each chapter of Wyler explores either a single film or a group of titles that are thematically similar. The focus tends to be on Wyler's more complex works. Less serious flicks like Roman Holiday (1953) and How to Steal a Million (1966) get much less attention, which I found disappointing. While these productions may not have been as challenging or thought-provoking, they are nevertheless a part of the director's career and I would have liked to have seen more stories about the making of these films and how he approached lighter fare. I also craved more details about Wyler's personal life. His marriages to Margaret Sullavan and Margaret "Talli" Wyler, the latter of which was one of the most enduring Hollywood unions, get only the briefest mention. His children get even less, two of them are referred to in a brief Wyler quote, and the fact that he eventually had four all together is not included at all. I would have given that a pass if the "Life" in the title of the book hadn't offered the promise of something that wasn't quite forthcoming. I'd been hoping to learn more about the man away from the camera and his professional circles in order to get a deeper perspective on his work. Overall, this is a much needed and expertly executed exploration of the role Wyler played in his work. The power of his films is undeniable; they are hardy classics that continue to draw an audience. With this book, hopefully his audience will also develop a greater appreciation of the man who so skillfully brought these visions to life.